Kim Jong Il has called for the expansion of a domestic computer network, according to domestic media reports. His comments were made earlier this month, when he visited the recently-built North Hwanghae Provincial People?s Study House, said KCNA and state radio. The study house was opened in September 2010 and covers 4,500 square meters, according to a BBC Monitoring transcript of a state radio bulletin broadcast on Jan. 21. Kim Jong Il toured the study house and visited the distance-education room and an electronic reading room, according to a KCNA report. After seeing the recently-completed rooms, he reportedly noted the need to expand the national Kwangmyong intranet service (an Internet-like network that is closed off from the global Internet) to all study houses in the nation. Saying that the reading [of books and materials] via the computer networks run by the North Hwanghae Provincial People’s Study House is not only an economical, but also an effective way of enabling the multitude of people to read in any place, Comrade Kim Jong Il noted the need to normalize the computer network service between the Grand People’s Study House and county libraries so as to scientifically organize and manage reading as required by visitors to the study house and thus continuously raise the level of their technological knowledge. – Korea Central Broadcasting Station news, 8pm, Jan. 21, 2010 via BBC Monitoring. 2 Comments on "Kim Jong Il calls for computer network expansion"
and a enemy to society as a whole. D.P.R.K has little power over the world ; they have zero influence on our lifes. They can only interfere with their own. US Government is justice and liberty and power. 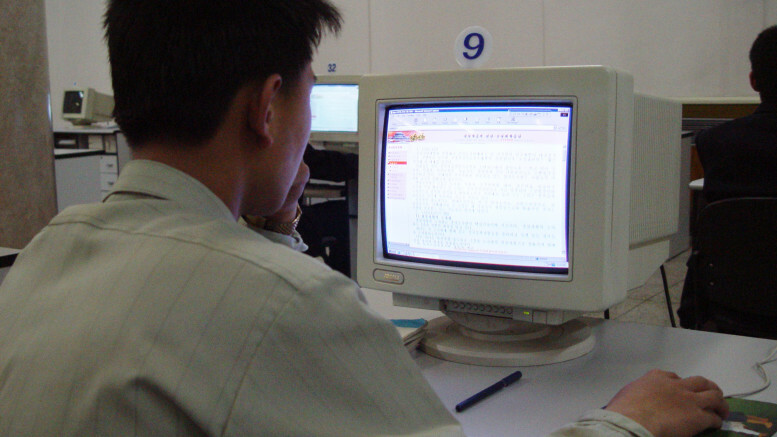 Sangwon Yoon » Archive » Is the inter-Korean conflict going cyber?